Redding, CA – Need motivation to get outdoors and explore great trails, pristine mountains, and rural terrain on your bike? Redding, CA Mayor Brent Weaver recently launched the Mayor’s Mountain Bike Challenge, the first event of its kind in the region, meant to inspire people to get out and get active. Now through May 18th Mayor Weaver challenges people from every fitness level to explore this majestic portion of California that has more than 225 miles of cycling and mountain biking trails, all within a 15-mile radius of the city center. Surrounded by national forests and state and national parks, Redding, the hub city for adventures in Shasta Cascade, holds several cycling focused events throughout the year, and is located just two hours north of Sacramento and three hours northeast of San Francisco. "Whether you are a lifelong resident or a first-time visitor, I am confident you’ll be amazed at the beauty and quality of our trails as you participate in the first ever Mayor’s Mountain Bike Challenge,” says Brent Weaver, Mayor of Redding. 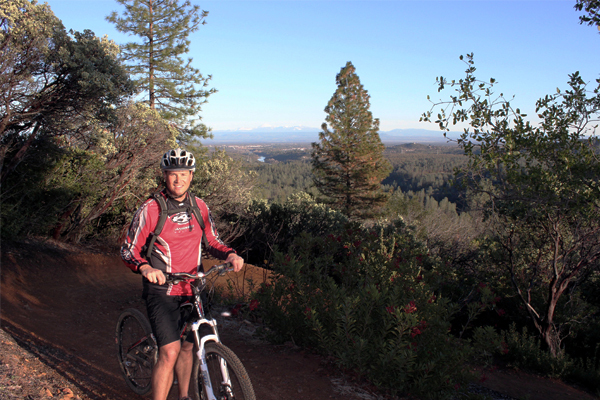 “Redding is fortunate to have world class trails with year round access. I hope you’ll enjoy discovering these trails and will continue riding them long after the challenge is over. We want to follow your rides on social media, please post pictures and comments on Instagram, Twitter, and Facebook with the hashtag #mtbredding. See you on the trails!" From flat paved rail trails to steep and rugged single track, this challenge offers a list of trails for beginner, intermediate, and/or advanced mountain bikers to tackle before May 18th. Trails and categories are listed on the Mayor’s Mountain Bike Challenge Passport, which can be found online here. Complete your passport and enter it to win prizes. Take this opportunity to explore new trails mapped out by local experts offering a variety of difficulty designed for every rider. All contestants successfully completing a category of rides will receive a bike water bottle and stickers commemorating the event. Your name will also be entered in the challenge raffle offering gift certificate prizes redeemable at local bike shops for $500, $750, and $1000, depending on your category. All successful candidates will be recognized on the Healthy Shasta website, and there is a special prize for those who are ambitious enough to “black out” their entire passport and complete all the challenge rides in all three categories. For more information on events like the Mayor’s Mountain Bike Challenge in Redding, please check the official events calendar. To discover all the adventures and attractions Redding and Shasta Cascade offer, and for additional information about the many amenities available, visit www.visitredding.com. Book your hotel, B&B or RV site today. Situated at the northern end of the Sacramento River Valley, Redding is the hub city in Shasta Cascade and is located just two hours north of Sacramento and three hours northeast of San Francisco. Boasting 300+ days of beautiful weather a year, Redding offers outdoor adventure and attractions all year long, along with great wine, food, sporting and cultural events, dining, lodging, and entertainment. The great Sacramento River runs through the center of town, helping earn Redding the fame of being America’s “Unofficial Capital of Kayaking” according to Time.com. Nearby scenic lakes, rivers, state and national parks, including Shasta Lake, Whiskeytown National Recreation Area, and Lassen Volcanic National Park, make Redding a fantastic base-camp for exploration in Shasta Cascade, offering Any Adventure, Any Day. Redding is conveniently located at the crossroads of I-5 and California state routes 299 and 44 and is accessible by daily flights from San Francisco. For more information or to order a visitor’s guide, visit www.visitredding.com, like our Facebook page www.facebook.com/VisitReddingCA or find us on Twitter at www.twitter.com/visitreddingca. Covering an area roughly the size of Ireland, the Shasta Cascade region is the perfect place to get back to nature, relax and enjoy the great outdoors. Comprised of eight rural counties historically known for being part of the pioneer gold rush in the mid-1800s, this majestic region of northern California is abundantly scattered with lakes, rivers, mountains, historic mining towns, and includes Lassen Volcanic National Park, two national monuments, six national forests and seven California state parks offering unforgettable fun and adventure. This area offers boundless outdoor recreation with magnificent landscapes and breathtaking vistas: from towering volcanoes, alpine ranges, and glaciers, to waterfalls, lush forests, pristine lakes, and roaring rivers; this travel destination is one of a kind. Shasta Cascade is easy to get to by auto, air, or Amtrak and offers an off-the-beaten-path experience where people discover the abundance of nature in one of the few unspoiled areas remaining in California. For more information or to request a visitor’s guide, visit www.shastacascade.com, like our Facebook page www.facebook.com/ShastaCascade, or find us on Twitter www.twitter.com/ShastaCascade.